Luc Weemaes, founder of Barbier, has been brewing his own beer since 1986. It all started when he was 18 and brewing was just for fun. He became a member of the beer- and winemakers guild Ambrasserie based in Clinge. His love for beer might have started even earlier. As a young boy he started collecting glasses and other relevant accessoires. The hobby grew to a collection of more than 1250 glasses in all sizes and shapes, of course he was already a member of the BAV (Beer Accessory Collectors). The hobby eventually faded away, but the brewing remained. Somewhere in the 90’s he became a schooled beer connaisseur. In the same period of time he managed to become a certified café owner, however he never did anything with this to make a living from it, but who knows… The sum of years of recreational brewing and being a beer connaisseur resulted in major improvements for his beers. It always remained a hobby with the results only being consumed at home. Until, in 2016, when he thought to bring his beers into the world. Barbier® was a fact. Barbier is a stylish beer, suitable for every occasion. The name already spoils it all, it’s preferable to drink Barbier at the barbershop, as it a custom to drink a beer when visiting. Barbier is beer with style. A style based on the customer and various elements of the barbershop. Barbier has many different kinds, but only one is for sale at the moment: the Irish Stout. A decision which makes sense considered the traditions of the Irish in relation to the barber. Barbier Irish Stout can be bought in the pub or through our webshop. It would be outrageous to say that only men with beards are eligible to drink this beautiful, exclusive beer. Forget it men! Barbers are generally known as tough men, so it makes sense that the font should be as tough as the barbers! The logo was designed to be vintage. Vests with a comb in their pocket are heavily associated with barbers, so we made sure we got that as well! Branding and the website for Barbier® was provided by Fresh Start Branding. Once again, it was designed to be vintage. The combination of logo, style, outlines and color make sure our tagline “Beer with style” is true. The tough but stylish image of the barber has been remodelled to fit in with our branding every single time. Tough, stylish, vintage and yet modern: Barbier®. A modern website suitable with Barbier®’s branding through color and media. 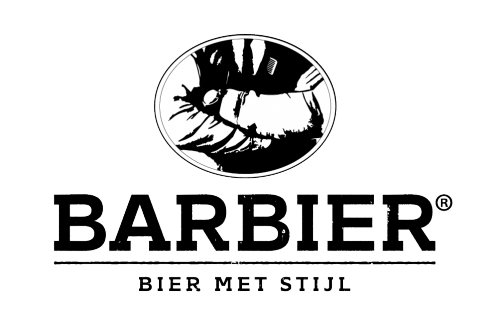 Barbier® is brewn by Brewery Vermeersen in Hulst, formerly known as Brewery De Halve Maan. For more information, check their website. Branding for Barbier® has been designed in collaboration with Fresh Start Branding. Websites, graphic and webdesign. For further information, visit their website. Yara Huijbregts – Text, support design. Suzanne Jacobs – Support design.